Sometimes my OCD rears its ugly little head...and January 1st is no exception. I was SOOOOOO thrilled yesterday when the calendars I ordered (at 50% off, thank you very much) finally arrived on my doorstep. PERFECT TIMING. My December calendar had spots for Jan. 1 - 3, so I'd just run out of space. Arrrgghh. 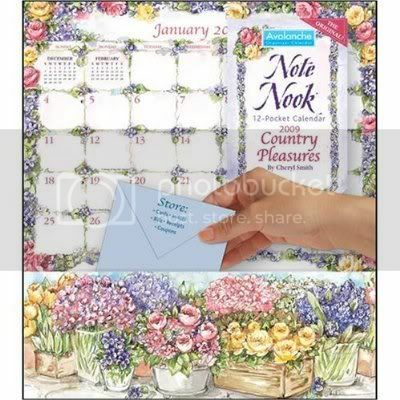 My favorite is the Note Nook Calendar by Cheryl Smith called "Country Pleasures," but there are many more designs to fit your style. I like this one in the kitchen because it matches my decor. I usually get the Bird or Botanical Note Nook for the office. Hockey game this winter? Tuck the tickets in the Note Nook! Tickets to a concert this spring? Keep them safe in the Note Nook! Wedding invitation for the summer? You'll have the time of the ceremony conveniently located in the Note Nook! Writer's Conference in the fall? Put your tax-deductible receipt in the Note Nook! I spent some quality time with my new Note Nook...transferring appointments, birthdays, and BIG EVENTS! Yippee!! Note: I don't get royalties for selling Note Nook Calendars. Image from amazon.com...your friendly Note Nook source!